MM14 EXTENDED BAG: The lid opening is 8 X 19 inches and has an overall height of 15 1/2 inches. 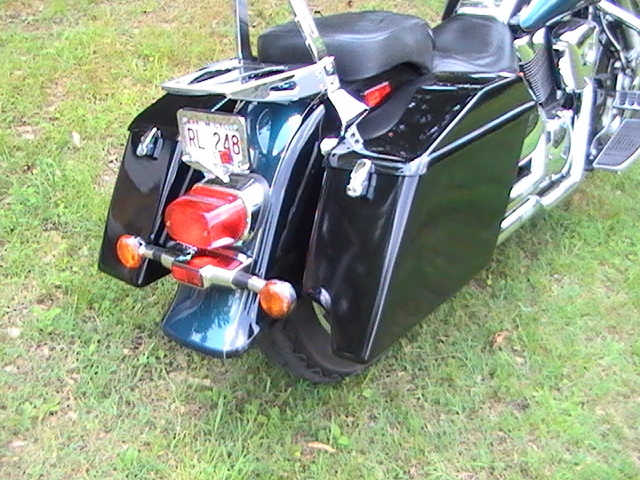 The slant on the front and rear makes the bag have an overall length of approx. 26 inches These can be ordered with both bags having a flat bottom, with the right side bag having the 'tunnel' for the exhaust pipes, or with both sides have the 'tunnel' for an exhaust pipe. The customer does the painting and configuring the mounts. Since the mounts are universal, the customer has to use his/her judgement on the exact position of the bags, drill the bags, and possibly add some spacers (not supplied) if necessary. On some bikes, longer bolts (not supplied) are required to attach the brackets to the fender rails as our brackets are a full 1/2 inch thick. Complete instructions are provided with each set of bags or an email copy can be sent on request. We do everything in house so that we can keep the price as low as possible. However, we do not do the custom painting of the bags at our facility. This allows the customer to find a local shop where custom graphics and colors can be applied. This way, if you get a scratch or ding, you can easily go back to the local shop and get a touch-up. You can also order factory matched paint online at www.colorrite.com if you prefer. Some auto paint stores can analyze the paint from your bike using a spectrophotometer and mix up a perfect or near perfect match.